This part describes spin properties of electron gas in solid (the spin properties of the conduction electrons). Spin properties of the electron gas (spin properties of conduction electrons) are mainly defined by features of electron scatterings. Here it is shown that even in the case of a spin-independent scattering the spin direction of an electron is not conserved and its spin may rotate. The scatterings, after which spin direction is not conserved, are rather frequent. A conduction electron in metal experiences such scatterings about each 20-200 femtoseconds. Because the time-inverse symmetry is conserved after a spin-independent scattering, it is possible to divide all electrons in an electron gas into the groups of the spin-polarized and spin-unpolarized electrons. The number of electrons in each is conserved after spin-independent scatterings. Spins of all electrons are in one direction. All electrons occupy only half-filled states, in which one place is empty. Click on image to enlarge it. Spin directions are equally distributed in all directions. All electrons occupy only half-filled states, in which one place is empty. Click on image to enlarge it. All conduction electrons in an electron gas can be divided into two groups of spin-polarized and spin-unpolarized electrons. The spin directions of electrons of the group of spin-unpolarized electrons is equally distributed in all directions. All spins of electrons of the group of the spin-polarized electrons are in the same direction. The properties of electrons in the groups of spin-polarized and spin-unpolarized electrons are different: (1) energy distributions are different (2) the transport properties are different. For example, the electrical conductivities for groups of spin-polarized and spin-unpolarized electrons are different. Because of this difference the electrical conductivity becomes spin-dependent (the magneto-resistance effect). Probability that a quantum state in electron gas is occupied by an electron from group of spin-polarized electrons (TIA assembly) (blue line) or from group of spin-unpolarized electrons (TIS assembly) (green line) or occupied by two electrons of opposite spins (full) (red line) or a state is not occupied by electrons (empty) (cyan line). The energy distributions of all electrons (spin-polarized electrons+spin-unpolarized electrons) is described by the Fermi-Dirac distribution. The individual distribution of the spin-polarized and spin-unpolarized electrons is described by the spin statistics. The spin-polarized and spin-unpolarized electrons have different energy distributions, because of their different scattering probabilities. The spin statistics is critically important for description of different spin-dependent effect in a solid. For example, the different distributions of the spin-polarized and spin-unpolarized electrons is a reason of a difference of conductivities of the spin-polarized and spin-unpolarized electrons. (left picture) The conversion from the group of the spin-unpolarized electrons into the group of the spin-polarized electrons (spin pumping) in a magnetic field. (right picture) Evolution of the angular distribution of the spin directions. The yellow sphere represents the spin distribution of the group of spin unpolarized electrons and the blue surface represents the spin distribution of the group of spin polarized electrons. The length of vector from center to surface represents the number of electrons, which spin is directed along direction of the vector. At initial moment, all electrons are spin-unpolarized. The electron spins are equally distributed in all directions. In a magnetic field, there are a spin precession. Due to spin damping, the spins are realigned along the magnetic field. At the final moment, all electrons are spin-polarized. Imaginary case of no scatterings is assumed. In the reality, at each moment the scatterings redistribute the electrons into the groups of spin-polarized and spin-unpolarized electrons (right picture). 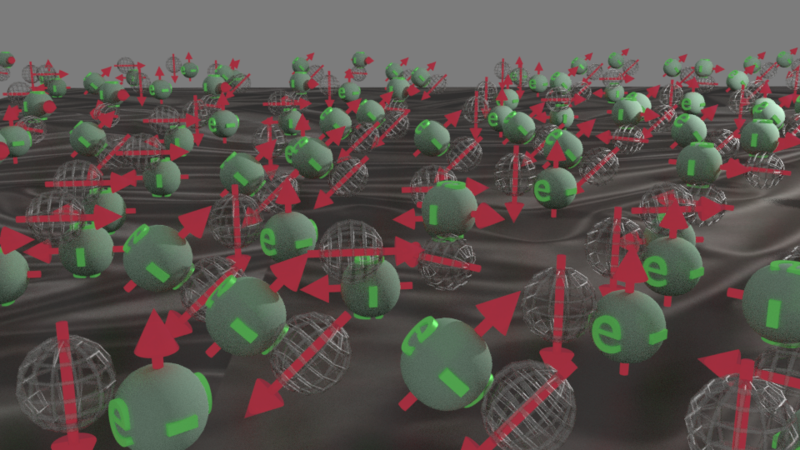 It is shown that in the magnetic field converts electrons from the group of the spin-unpolarized electrons into the group of the spin-polarized electrons (spin pumping). There is a spin precession around the magnetic field. 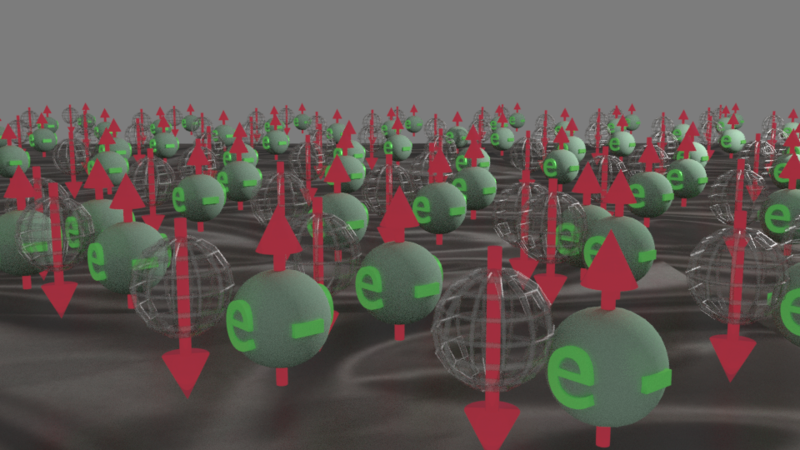 Due to the precession damping, the spins of spin-unpolarized electrons are aligned along magnetic field. Therefore, the electron gas becomes spin-polarized. The spin-pumping by a magnetic field is called the Pauli paramagnetism of electron gas. The Pauli paramagnetism occurs because a magnetic field induces spin accumulation in a non-magnetic metal and the spin polarization of the non-magnetic metal becomes non-zero. Therefore, an effective magnetic moment is induced (paramagnetism). Comparison of mechanisms responsible for the Pauli paramagnetism as represented by the model of spin-up/spin-down bands (left) and the proposed model (right). In equilibrium the conduction electrons in a ferromagnetic metal are in both groups of spin-polarized and spin-unpolarized electrons. The spin polarization of the electron gas or the number of electrons in each group is determined by the balance of the spin pumping and spin relaxation. The conversion from the group of spin-unpolarized electrons into the group of spin-unpolarized electrons (spin pumping) occurs due to the exchange interaction between local d-electrons and the conduction sp-electrons (the sp-d exchange interaction). The spin relaxation occurs due to spin-dependent scatterings and other mechanisms. The interaction of two groups of spin-polarized electrons with different spin directions. The radius of arrows corresponds to the probability of electrons to be in each group and the angle indicates the spin direction. Blue and red arrows correspond to two groups of spin-polarized electrons of different spin directions. The spin torque occurs when electron gas is already spin-polarized and a small amount of spin-polarized electrons of different spin direction are injected. As result, the spin direction of all spin-polarized electrons rotates toward the spin direction of the injected electrons. The spin-torque current is a current flowing between regions, which have different spin directions of the spin-polarized electrons. The spin-torque current induces a spin torque on the spin-polarized electrons. The torque rotates spin directions in neighbor regions toward each other. The spin-torque current aligns the spins of all spin-polarized electrons in one direction over the whole sample. Magnetic tunnel junction as a memory cell. The spin-transfer torque is the torque acting on the magnetization of a ferromagnetic electrode of a magnetic tunnel junction (MTJ), when an electrical current flows through the MTJ. The spin- transfer torque acts on spins of localized electrons (d-electrons). The spin-transfer torque occurs due to a flow of conduction (delocalized) electrons. The optimization of the spin transfer torque is an important task for a variety of practical applications. The sp-d exchange interaction between conduction electrons and localized electrons is the physical origin of the spin-transfer torque. The model of spin-up/spin-down bands has been used and it is used by many researchers. There are several incorrect assumptions and oversimplifications of the model of the spin-up/spin-down bands. The basic assumption of this model, that electrons of only two opposite spin directions can coexist for a long time, is incorrect. This is because the spin rotation during frequent spin-independent scatterings mixes up the electrons all spin directions within a very short time. Despite all differences, the described model should not be considered as a contradiction of the model of spin-up/spin-down bands, but rather as its extension. The similarities between the models can be seen especially in the case when the direction of spin accumulation is the same throughout the whole metal. For example, there are similarities in the description of Pauli paramagnetism and of the properties of conduction electrons in a ferromagnetic metal in both models. Of course, there are still some differences, because the the model of spin-up/spin-down bands ignores the spin rotation during spin-independent scatterings. Some correlations between the models can be made. For example, even though the model divides all electrons into groups according to their spin projections, the measured parameters of the model of spin-up/spin-down bands are spin accumulation and charge accumulation, which are features of really-existed groups of spin-polarized and spin-polarized electrons. Quick comparison with the model of spin-up/spin-down bands. Conduction electrons in a ferromagnetic metal. (left) Classical model of spin-up/spin-down bands. The blue band is the majority band and the yellow band is the minority band. (right) Model of TIS/TIA assemblies. The blue assembly is TIA assembly and the yellow assembly is TIS assembly . (1) All conduction electrons are divided into two groups: (1) a group of the spin-polarized electrons and a group of the spin-unpolarized electrons . (3) In group of the spin-polarized electrons:Spins . The classical model used for the description of the magnetic properties of conduction electrons in metals is the model of spin-up/spin-down bands. In this model it is assumed that all conduction electrons in a solid occupy two bands, which are named spin-up and spin-down bands. The electrons of only one spin direction occupy each band. Based on the fact that the probability of a spin-flip scattering is low, it was assumed that the electrons are spending a long time in each band and the exchange of electrons between the bands is rare. Using this key assumption the classical model describes the transport and magnetic properties of conduction electrons independently for each spin band. It includes only a weak interaction between the electrons of the spin-up and spin-down bands. For example, in the classical Pauli’s description of paramagnetism in non-magnetic metals, it is assumed that electrons in one band have spin parallel and electrons in another band have spin anti parallel to the direction of the magnetic field. Without a magnetic field there is an equal number of electrons in each band and the total magnetic moment of the electron gas is zero. In a magnetic field the electrons with spin parallel to the magnetic field (spin-up) have lower energy compared to the case with no magnetic field, and electrons with spin anti parallel to the magnetic field have higher energy. In equilibrium the Fermi energy is the same for both bands. This means that in a magnetic field some electrons had spin-flipped from the spin-down band to the spin-up band and so the number of electrons in the spin-up band became larger than in the spin-down band. Because of this difference, the magnetic moment of the electron gas became non-zero. It has been assumed that the spin-flip from one spin band to another takes a relatively long time. This makes it possible to define separate Fermi energies for spin-up and spin-down bands in the classical model. The energy distribution in each spin band is described by the Fermi-Dirac distribution with different Fermi energies. The Fermi energies of the spin-up and spin-down bands relax into a single Fermi energy within a certain time, which is called the spin relaxation time. The same content can be found in V. Zayets JMMM 356 (2014)52–67 (click here to download pdf) or (http://arxiv.org/abs/1304.2150 or this site ) . Click here to download audio presentation (voice of my daughter Sasha) or (my voice), which introduces the presented model of an electron gas in a solid.